One size fits ALL! The direction is given for one size and the difference for Infant/Child/Adult sizes is the different yarn used (Light/DK 3/Medium 4). This so sweet and feminine hat is just perfect for a lady of any age and can be made in any color and worn with any crochet accessories, ribbons or whatever you can think off! Just have a fun creating a look you will love!! A great addition for spring/summer wardrobe. This hat is fun to make and fabulous to wear! The eBook is available for download for FREE. Please note: This pattern is for crochet hat ONLY! The matches crochet Poppy , Dandelion and Daisy accessories patterns sold in my Shop (scroll down to locate them), at Etsy and some others stores (please see “Online Stores” at right sidebar on this site). 7 pages; 6 pictures; 2 diagrams. Thank you so much for these free hat patterns..with the economy the way it is..it’s nice to get something so special for free! I have a grand-daughter that will look adorable in any of these hats and I have some neices that need a cute spring hat..Thanks again! Thanks for another beautiful pattern!!!!!! Thanks, it will be a happy Monday now! have a great day! 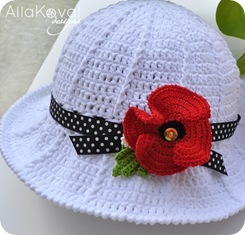 Alla, Thank you so very much for the free pattern for the Garden Party Hat!! They are adorable and I am so very anxious to start crocheting them !!! Your work is exquiste as usual!!! GORGEOUS!!! Thank you very much Alla. You are a sweet “Crochet Lady”. Thank you so very much for your free patterns. I just made a top for my great-niece. So nice! Another beautiful creation! As I have no little girls to crochet for, I’m going to try to upsize one for me. If successful, I’ll contact you…I’m thinking that these would make wonderful chemo hats. Thanks for the freebie! Oops! Once again I goofed and sent my comment before carefully reading that adult sizes are included. Now you’ve made my job that much easier. Thanks so much for the free hat pattern. They look so beautiful. I can’t wait to make one or two!! You’re the best! Also, I love that you designed it for all sizes. Алла, очаровательные шляпки! Большое спасибо за бесплатное описание! Большое спасибо за такой замечательный весенний подарок!!!! Алла,шляпки – чудо, как хороши! А у вас потрясающий вкус, и удивительная работоспособность – именно в создании безумно красивых вещей!!! Я еще не совсем разобралась с переводом, но может быть вы быстрее подскажите: вы что-то вставляли в края шляпок, чтобы они так хорошо держали форму? Thank you for a free pattern. The hats are very beautiful. Great work!!! I`ll crochet it for my 2 daughters -sunshines!!! Алла, спасибо огромное за Вашу фантазию и мастерство!!! Шляпки просто великолепны, не терпится взяться хотя бы за одну из них. И конечно же благодарность за бесплатное описание! Thank you so much Ladies!! It was such FUN to work on these hats as and pattern too ;) I’m SO GLAD you like it! Марина, я ничего не вставляла в края шляпок – пряжа, кот. я использовала сама по себе хорошо держит форму, плюс последний ряд, связанный рачьим шагом, тоже помогает держать форму. Oh WOW! Thank you so much! This hat is just darling. I’ll be linking in this afternoon’s Daily DIY. Алла! Вы, как всегда, на высоте! Спасибо вам большое за новые идеи! The hats are adorable. I just check the tutorial and is as beautiful as the hats. Thanks for sharing this. Oh I love this hat pattern. Thank you for making it available in the pdf format. You’ve done a beautiful job with the hats and with the tutorial. Thank you for designing and sharing this lovely pattern. My nieces will love these hats! I really love these hats but can’t print the instructions. I keep getting the file is damaged. Please help me. Any suggestions welcome. Your hats are ‘par excellence’! 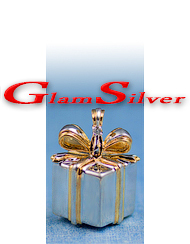 Your ability to create quality, by using simplicity, is very rare to find, and easily recognized as superior! You have the ability to know that “How can something be so pretty and so simple?” because that, in itself, is the beauty. I love this hat and I look forward to making it…in fact I started it but can not for the life of me figure out what FPdc is. I know the last two stands for double crochet could someone please take pity on me and expain the FP part. Thank you Alla that helped a lot! 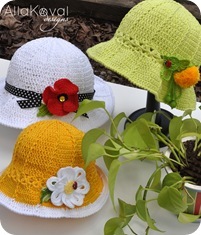 Please help for some unknown reason unable to download and absolutely love these hats cant wait to make them. Hola, Muchas gracias, preciosos los sombreros son adorables. Un gran abrazo desde Lima-Peru. Thank you soooooooo much for this lovely pattern,Alla!! !It’s fantastic! I little help,please! How many dc must be in row 4 /1st row after the diagram 2/? I have 150 dc and may be made something wrong,because when joining with the beginning of row 4 I have 14 dc /instead of 11/. Thanks and pls don’t forget to add the flowers soon!!!!! I make chemo caps and would like to know if you can adapt the Garden Hat pattern to knit? Thanks sooooo much for this pattern. I lost my job and had 4 girl birthday parties to attend with my daughter. I made this pattern 5 times, once for my daughter and 4 others as presents. Two of the moms were in disbelief that these were handmade. Thanks again! I cannot open the pattern for the hats. I just love these. I just had my first granddoughter and would love to make some. Could you email me the patterns. Thanks again they are beautiful..
Thamlk you for this really beautiful pattern I started it yesterday and love the pattern. 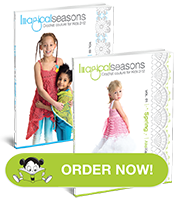 I have 6 granddaughters and they are going to love it. Can’t wait to get pattern for the flowers. Thank you so much! Been searching a long time for a sunhat like these. But I am unable to get the pattern, every download no matter which way, comes up stating file is damaged and unable to repair. Is it possible you could email the pattern to me….Many thank. Some super patterns here I will be making many more visits I am sure. Thank you so much for this lovely hat pattern. I will be making this in many colors. This hat pattern is so lovely. The different colours and trimmings make them unique. *smiles* I am going to do some for my granchildren. Could you tell me if you have any of the flowers etc used on your hats as free patterns? would love to have them to add to my hats. Thank you so much Ladies!! I’m so glad you like it! 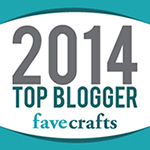 Heather, please see “My Free Patterns” at right sidebar. I have Roses bugs and butterfly pins, which can be work perfect with this hat. Which dc do I make the FPdc around, the newly created dc or the one I just worked in from the previous round? Please feel free to email with any question you may have. I to would love to recieve your pattern for the flowers on the Garden Party Hats, though I may be able to figure them out through trial and hier. I am 64; and work as a school cafetiria monitor. I would love to make these hats for the ladies whom work,cooking the school lunches and get no thanks even from the school board, for their hard work here in Harvey. Louisiana; at Ella C. Pittman Elementary School. These ladies work very hard. There are about ten of them. Without the flowers for the hats the beauty is lost. OR/ The School where I work! Thank you for all your free patterns. They help lots of us who are on budgets as paterns are costly these days , and being able to make and give a gift is a wondreful thing when money is low. And the patterns you give free are are so beautiful. again thank you. This hat is fantastic, I can’t wait to make it. It is beautiful. I don’t understand what you mean by moderation, please tell me. I just love this hat. I am making them for my granddaughters. Like the others i would really love the pattern for the flowers I have looked on the web for flowers and there are none out there like these. Please add them on your site. Very nice. Esp the flowers like icing on a cake. I love this hat. It’s a brillant pattern design. The FPDC used to make the cable and the increase in the hat was a wonderful idea. 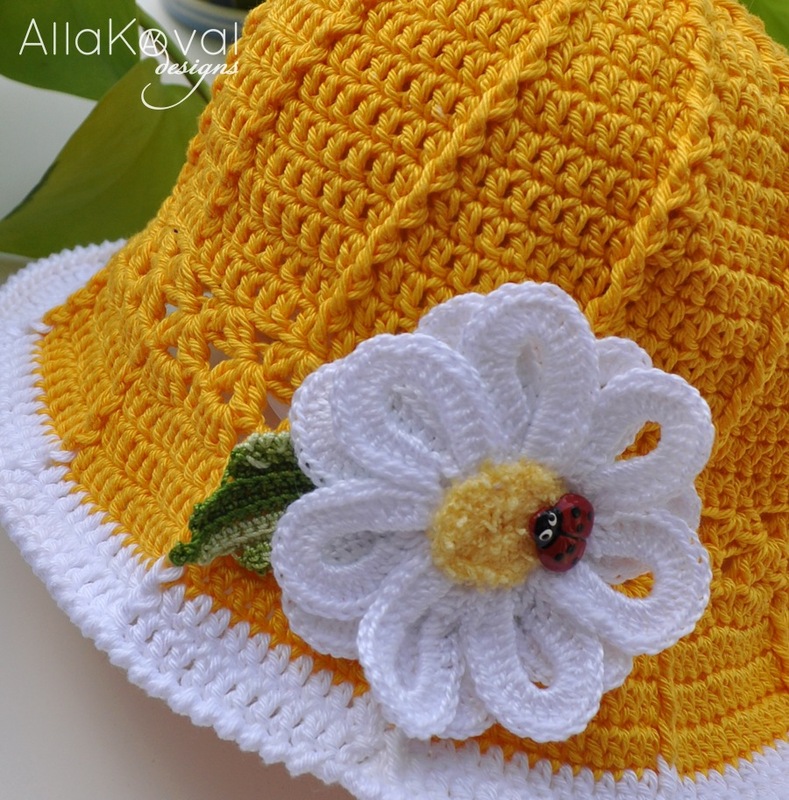 I am trying to make this hat for my daughter because she has to have laser treatment on her face and needs a good hat to keep the sun off her face even in the winter months and I thought that this little hat would not only keep the sun off of her face but it would be beautiful too. My only problem with the pattern is that I got all the way to rnd 13 or 14 when I realized that my hat was looking more like a dollie instead of a hat. Is there suppose to be any decreases or some kind of shaping in rnds 9 – 16. I am going to try to decrease in these rnds. I hate to add something to someone else’s pattern but I don’t know how else to get the same results. I try to always follow the patterns but sometimes things are left out by mistake but didn’t know if that’s the case. It may just be the way that I’m reading the pattern. Thanks for the wonderful patterns on here and for your time. 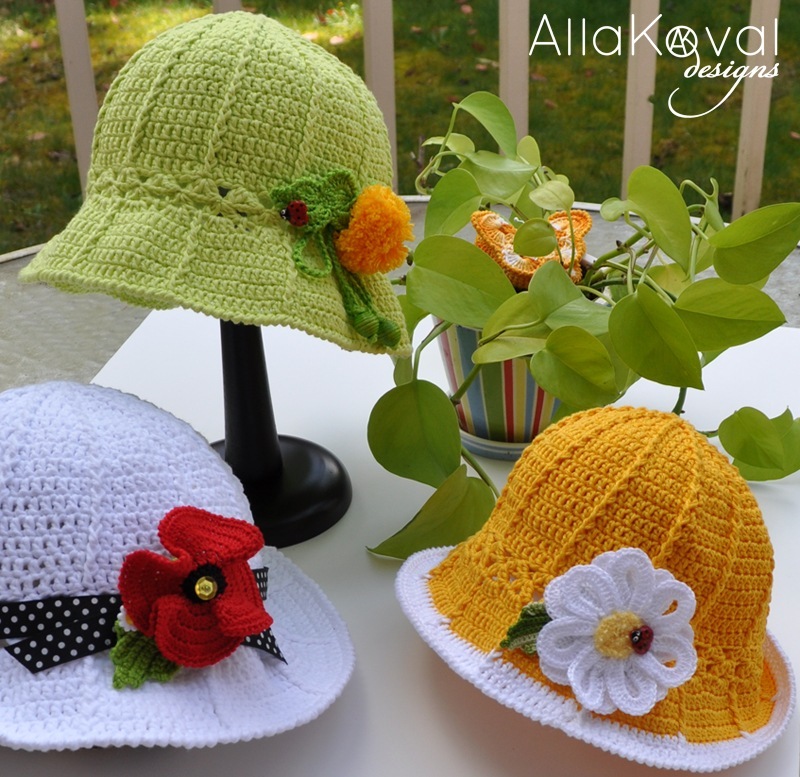 I love this pattern but also love the flowers that are on each of these hats. If you could please send me the patterns for the 3 different flowers, I would very much appreciate it. I have 3 granddaughters and would like to make one for each of them. Thank you so much for your interest. Crochet Poppy, Dandelion and Daisy flowers patterns sold in my Shop (please go to my shop and scroll down to locate them), at Etsy and some others stores (please see “Buy my patterns at” at right sidebar on this site). May I ask if the gauge information for this hat is correct? I’ve been reading it over and over and not catching the sense of it. Plus, after checking these hats on Ravelry many of the users had gauge trouble. My stitches are already quite snug but nowhere near the recommended number of rows for 4″. Please help. Thank you for offering this adorable little hat. I would like to make it successfully. Thank you for letting me know. I mean correct gauge is: first 6 (10, 14) rounds = 4”. Sorry it was confusing that way described before (with diameter) ;) Pattern is updated. for the small size, the 1st 14 rows = 4″ from center to edge? i.e., the radius? for large/adult, the first 6 rows = 4″? isn’t that how it has to go for the full pattern to make a smaller hat? Many thanks! I am working this up to get the hang of it first, but have friends who are very excited about this hat and want one soon! Yes, Barbara’s translation is correct. @To everyone: Please make sure that you have last version of this pattern. I have fixed gauge part and now it not should confuse nobody ;) Thank you so much!!! Olá, sou brasileira,não falo inglês, mas admiro teus trabalhos, tanto que, fiz chapéu em crochet, baseado nas fotos que vi aqui,porém não consegui download das receitas, deu erro.Eu mesma desenvolvi receita para tamanho adulto. Não ficaram tão maravilhosos quanto os teus. Pretendo futuramente postar imagens e minha receita, mas deixarei em meu blog, as imagens com o teu link e os devidos créditos. Teus trabalhos são maravilhosos! . Não consegui download das receitas,então copiei somente as fotos. Desenvolvi receita em tamanho adulto, e fiz em outras cores.Claro que não ficaram como os teus, Pretendo postar em meu blog tuas imagens e teu link, deixando teus créditos. Sou brasileira, mas inseri banner para tradução em minha home page. Se quiser passe lá. Hi there, just wanted to say that your hat pattern is beautiful. I have made two in different yarn weights and both have turned out huge. I adjusted to a smaller size needle also. I used Peaches & Cream cotton yarn & then a soft baby sport weight. I love the pattern & would love to get this right. I would dearly love to make this for my granddaughter and nieces. Could you email me the pattern? Thank you so much-excited to get started. Would you please address the question(s) regarding where the decreases start with this pattern. Sorry to be such a bother, but I really do not want to do all the work and still have a huge hat. Thank you very much for your time a beautiful patterns. If you met gauge and followed instruction, you should get hat exactly as pictured. If not – I agree, looks as you done something wrong. I would recommend to double check that you do not make extra increasing (at least it’s explains why you get a dolly shape). For the size… Please make sure that you met gauge. To make hat smaller, I would recommend use smaller size hook or thinner yarn. Fran, I’m sorry, but how my video tutorial on You Tube will help to meet a gauge?! ;) If talking about special stitches and crochet techniques – I’m sure on You Tube LOTS videos are available already. I received a bill on my card on 2/24 for $8.50 and havent received any flower patterns. Whats wrong? Thank you so much for for letting me know. Your pattern was available for immediately download right after payment received. You should received confirming email with link for download at email address you’ve filled up in order form at checkout). I’m sorry if you did not get it. I’ve just sent your pattern via email. Please let me know if you did not receive the pattern. Please feel free to email me with any questions you may have. Did you figure out how to make the hat without it looking like a doile? I am having the same problem. Thanks! made one in the child and it looks like i will fit my 9 yr old grandaughter( turned out beautiful) but would you use the baby size for a 4 yr old or use a smaller hook when making the child size??? Очень красивые работы. Спасибо! Вы большая умница. the hats are very nice, how can I loading it? Just click on garden_party_hat_v4.pdf link and then save/print the pattern. The only thing you will need Adobe Reader to open the file, which you can download from Adobe website. Dear Alla, these are great looking hats. I’m working on some hats for friends and relative’s children for gifts, and these are ones I keep coming back to. I have some great bamboo yarn that I think I may make into a hat for me on this too. It’s a soft lavender color. Thanks for providing the pattern, and I’ll post if I have any questions. Thank you for your so much!! I am new to crochet but I am not tired of looking at your designs, they are stunning and lovely. I will try ;) to do at least one. God bless the girls are just angels. Such a lovely hat, I purchased yarn for each size. Am having difficulty meeting the gauge even with adjusting the hook size. On the third try, my gauge is close enough, but I’m not going to have enough yarn. I’m using cascade cotton rich, 2 balls. I can’t figure out why my finished rows measure smaller than the required gauge, yet the hat seems big, that doesn’t seem right, does it? Help! close enough gauge is not EXACTLY the same gauge, right?! ;) I would recommend use a bit thinner yarn than Cotton Rich. I hope this help. I really would like the White Daisy flower pattern on your Garden Hat.According to FAVECRAFTS, this pattern was supposed to be free but I cannot find it? I am making this hat for a Birthday gift for a friend and she loves Lady Bugs and flower pins. Your patterns are awesome. You are a true crochet artist. I accept the gift ! a great one ! thank you so much !!! This Garden Party hat pattern looks gr8! And from the comments, looks like it is a hit. I have tried all afternoon to download the poattern and noticed one other person had trouble and requested you to email it to her. Would you be able to email me the pattern also? 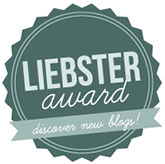 I would so very greatly appreciate it :-) Thank you so much! « Where do you buy yarn?